This is a guest post by Jeff Hofstetter, the President of Xtreme Lean Consulting. 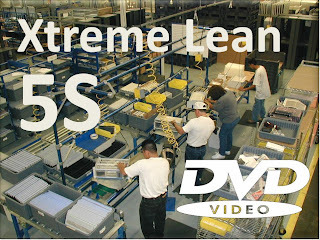 I previously wrote about Jeff and his company in this post on Xtreme Lean's 5S Quiz and Learning Videos. 5S is a powerful improvement process that gets impressive results. It is an essential part of Lean manufacturing because it focuses heavily on the elimination of waste. This is also a great place to begin a Lean program for any business. The main challenge of implementing 5S is developing a shopfloor understanding of its key points and tools. It is important for all employees to have a good working knowledge of 5S before you begin, and this new DVD uses easy to understand graphics and animations which clarify what 5S is, how it works, the numerous benefits, and how 5S can be implemented at your business. This DVD will make it easy for your entire workforce to comprehend all of the principles of 5S with examples of Sort, Set-in-order, Shine, Standardize, and Sustain being explained in detail, and how they can be applied at your business. 5S will help your business eliminate much of the waste found in almost all manufacturing processes. When you implement 5S and become Lean you will realize all of the benefits 5S has to offer your business. You can purchase the full version of this DVD by visiting this website, and then you too will be on your journey to a leaner more competitive business.